The Verbier Festival Orchestra (VFO) is recognised as one of the world’s best training orchestras. 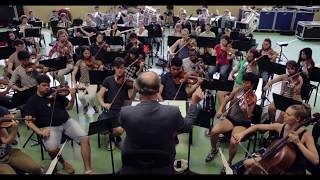 Since its founding in 2000, the orchestra has united the most accomplished young orchestral musicians from across the globe with the foremost conductors and soloists of our time, among them Maestro Valery Gergiev, its Music Director. The 2019 VFO summer programme continues the orchestra’s tradition of artistic excellence with concerts conducted by Valery Gergiev, Franz Welser-Möst, Manfred Honeck, Lahav Shani and Fabio Luisi. Programmes will include monumental symphonic works including Bruckner’s Ninth, Mahler’s Second and Shostakovich’s Fifth Symphonies, Stravinsky’s Petrushka, and Richard Strauss’s opera Die Frau ohne Schatten. Explore the tabs below to learn how to apply for the 2019 VFO programme or download documentation here. Applications to Verbier Festival Artist Training Programmes are now closed. The 2019 VFO live auditions took take place in: Berlin, Cologne, Geneva, Moscow, New York, Paris, Philadelphia, Rome, St Petersburg, Vienna and Zurich, from January to early March 2019. We will not be auditioning live for harp applicants, and therefore only video applications are possible. Live auditions will be held only in Geneva and New York. If you cannot audition in one of these cities, please apply via video. 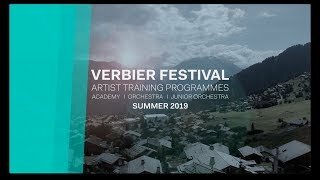 Applicants to the Verbier Festival Orchestra must be aged 18 to 28 on 1 July 2019. Musicians are invited to become members of the Orchestra for one edition of the Verbier Festival. They may be re-invited twice; these re-invitations are not guaranteed. To be re-invited, musicians must be aged 29 or younger on the last day of the festival (3 August 2019). Successful candidates are required to sign an agreement with the Fondation du Verbier Festival, thereby committing to the entire Verbier Festival Orchestra summer session from 1 July to 3 August 2019, and accepting all rules of the Orchestra. Each position in the Verbier Festival Orchestra is fully funded by the Verbier Festival, including travel to and from Verbier, lodging and meals. You will be notified of your live audition date and time by email by the end of December 2018.Should you already know that you are unavailable on a particular date, please inform Samuel Goldscheider, Orchestras Manager. While the Orchestras team does its best to accommodate scheduling requests, it cannot guarantee that all requests can be met. Please note: Dates and venues are subject to change; do not book your travel or accommodation before receiving confirmation of your audition. There will be a jury of at least 2 people in each live audition, and each audition will also be video-recorded by the jury. Please note that you must perform all the works/orchestral excerpts listed under ‘Audition Repertoire’ here. You must play the works as if you were giving a live audition (i.e. straight-through in the order listed). The recording must be made in one shot, without cuts or edits. The recording of the one or two solo works (depending on the instrument) should be approximately three minutes’ duration each (typically the exposition of the concerto or sonata), without any accompaniment. Please choose a place which makes musical sense to stop; recordings that are slightly longer than three minutes are acceptable. Please take into account the size of the room and its acoustic as well as your distance from the camera: the more reverb in the room, the closer you should be to the camera (usually 3 metres or 10 feet). The use of artificial reverberation or any other audio modification software is strictly prohibited. IMPORTANT: listen to your recording to check that it is what you want the jury to hear. Once you are ready to upload your recordings, choose ‘Video Audition’ in the application’s ‘Audition City’ dropdown menu. Once you have submitted your application and paid the application fee, you cannot return to your profile to upload a video. Please click the link below to access the VFO 2019 Audition Excerpts for your instrument. Verbier Festival Orchestra Ambassadors include members or former members of the Orchestra from around the world. They are available to answer your questions about the application procedure or auditions and are happy to share information about their experiences as part of the VFO. We do not accept applications from candidates younger or older than the stated requirements. Musicians aged 15 to 18 may consider the Verbier Festival Junior Orchestra. Musicians aged 18 may apply to either the VFO or VFJO. When will my live audition be scheduled? The specific dates of auditions in each city will be listed here in October / November 2018. You will be notified of your assigned date and time by email by the end of December 2018. I already know that I’m not available on the day planned for my preferred audition city. What shall I do? Is priority given to either live or video audition applicants? Priority is not given to those who audition live. However, we recommend auditioning live in order for the jury to meet you in person. Can I bring a pianist to my audition? All auditions are unaccompanied, so you cannot bring a pianist. Does the quality of sound for video applications matter that much? Yes, the sound quality is of great importance for your video audition. Please read the ‘Video Audition’ information. Can I play a different concerto movement or a different excerpt than the one listed under ‘Audition Repertoire’? You must play the concerto movement or excerpts listed for your instrument – in order for us to be able to judge all of the applicants fairly, we cannot accept any changes to this list. Can my CV be in a language other than English? Yes, we accept CVs in English, French, German or Spanish. Do I need to record my video with or without the score/sheet music? You may record your video with the score/sheet music.